The U2O 1950's Bride doll can be seen here parading for the camera in an Agatha outfit for a Madame Alexander Jacqueline doll. 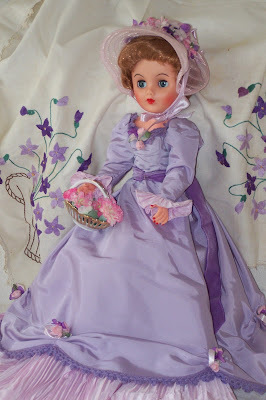 These Jacqueline dolls were made in the 1960's, and were still being made in the 1980's when this outfit was released. 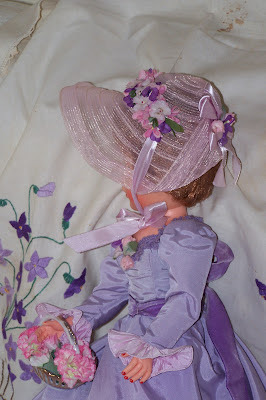 I initially bought the hat that goes with this outfit to cover up the hair of a poor Madame Alexander Cissy doll who was a little worse for wear. I ended up buying the dress in a separate auction on ebay so that I would have the matching outfit. The U2O Bride doll will have to give this hat back to the Cissy doll soon, so she had better not get too fond of it. Perhaps I should make the U2O Bride doll her own outfit. Something else to add to the sewing queue! I have got the felt to make my Ella doll's hat, so I will try and get to that soon. I have come down with the second cold in about 2 weeks, so not feeling up to much. Hope you are happily sewing though! Hi Megan, I couldn't find your email address so I hope you come back to read this post. 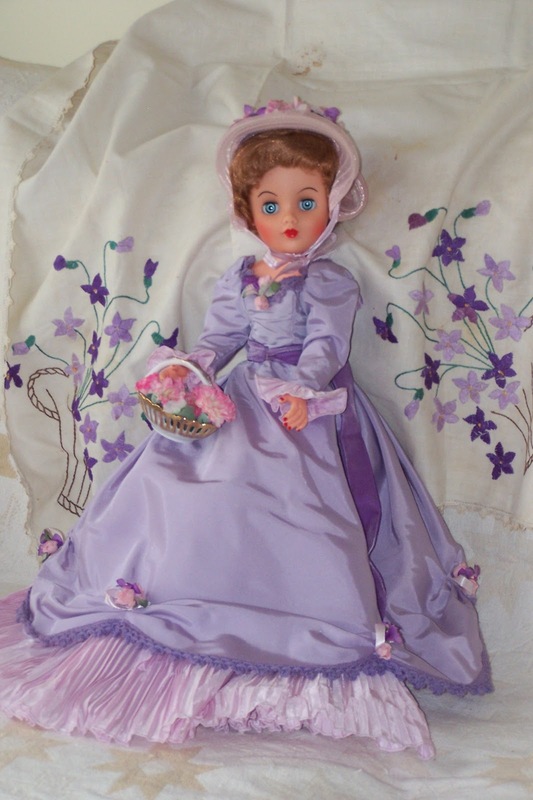 As far as I could tell, according to one of my doll reference books she was a cheap copy of the Revlon fashion doll, and was made in the 1950's in America. You are very lucky to find her with all the extra clothes and shoes. If you click on the link U2O doll on the right of my page, you can see the original bridal dress that she came in. Thanks for your comment. Hi Lizzie, I have a doll very similar to yours only mone is 24" tall. All she has on her neck is 111. I suspect having read your info she also is a cheap copy of the 1950's dolls but who. She has no earrings and painted nails, hard plastic and vinyl head and also very well made with short coarse hair and twists at the waiste. 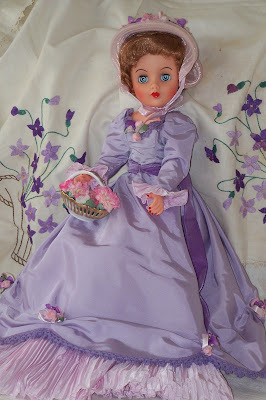 She is so similar to your doll only she has painted lashes on the outside corners of her eyes rather than the the lower under eye as well as sleep eyes with long lashes.